"The Perfect Pair" Wedding Favors! This section is a cute play on words! 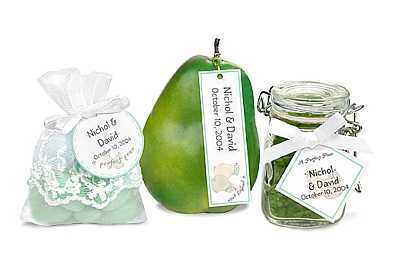 You will wedding favors that are pear shaped, pear scented, or pear flavored. Using "pear" to symbolize "pair"! Mini pear candles, pear candles, pear soap, pear candy, pear everything! "Perfect Pair" Silver Plated Salt & Pepper Shakers -BB These little "perfect pair" pear salt & pepper shakers are the unique items that you were looking for. They are 2.25" tall and come in a clear box. Just Perfect for "the perfect pair" wedding favors! Only 7 sets left in stock. Discontinued. "Perfect Pair " Pear Candles II Celebrate the "Perfect Pair" with handcrafted pear shaped candles presented in a sheer ivory organza bag. These pear candles are life-like in their shape, color and design. 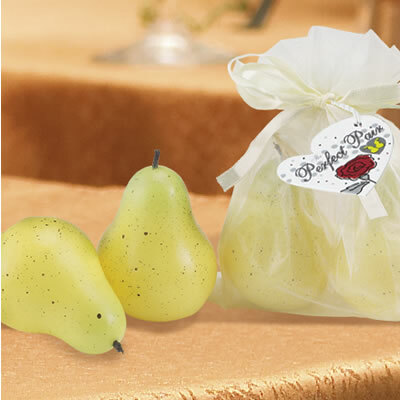 Each handcrafted pear candle measures 1.5" x 2.5" and 2 pear candles are presented inside a sheer 3.5” x 4.5” ivory organza bag with a satin ivory cinch tie. Each favor is complete with a white heart shaped tag that reads “Thank You.” Price is per pear candle set. Minimum order is 20 sets. 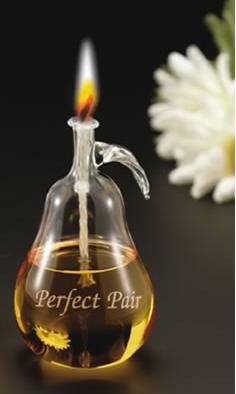 "Perfect Pair " Pear Candles III These are excellent keepsake pear candle favors! These candles are not the miniature pear candles. The color is pear green. These candles are 3" x 2.5" . They are lightly pear scented. These candles would also make great place card holders. Minimum order is 12. Price is per pear candle. The "Perfect Pair" can have the "Perfect Pear"! These make great favors for a larger number of guests. You can give the larger pear candles to your wedding party and close family and friends. And then use these for your other guests. 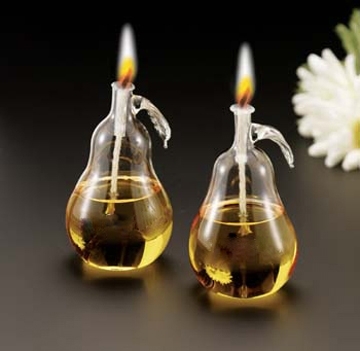 Make sure that you take a look at the miniature apple candles. You know that saying "The apple of my eye". Another play on words that is really cute. Don't forget to order your personalized favor tags to complete the favor! These are not favor packaged. They are bulk packaged. Price is per mini pear candle. Minimum order is 12. If you choose to have them put in an organza bag with a personalized tag, put your personalization in the comment field below. Large Pear: 3" x 2.5" Medium Pear: 2" Small Pear: 1.75"
"Perfect Pair" Mini Pear Soap Your guests will love these beautiful, handmade mini pear soaps. They have a light pear scent, green in color and are 1 1/2" tall. Each pear weighs ~1.5 oz You can put 1 mini pear soap in our 2" clear box, or a "pair" in the 3" or 4" box. They are great for hotel gifts or bridal shower gifts! Sold in increments of 9, bulk packaged. Boxes are sold separately. Price is per mini pear soap. Soaps are hand made and will vary in color. 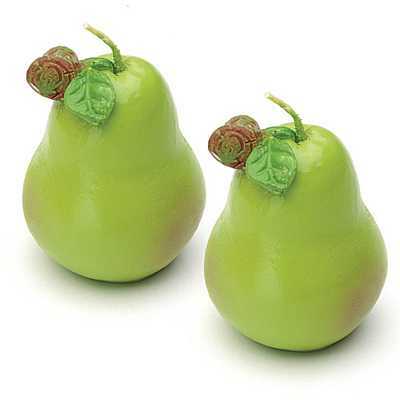 These three dimensional barley candy pears are perfect for your elegant event. 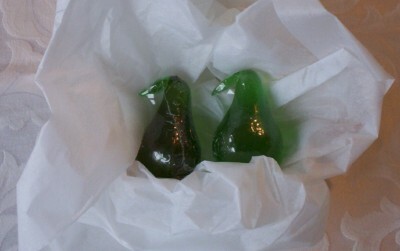 They are hand made barley candy pears. They feature a cute little leaf. How cute! We love these! Pear flavored. 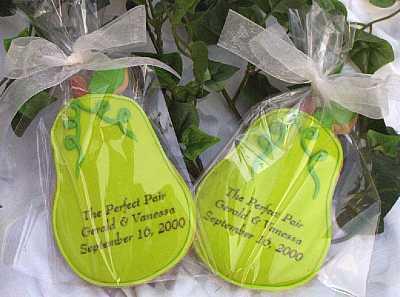 The perfect "perfect pair" pear favors. Great for bridal shower favors and wedding favors. Individually shrink wrapped. Small pear can stand on it's own. Large pear may not stand on it's own, therefore it may be necessary to packaged or placed horizontally. If you remove the shrink wrap, the pears will stand on an even surface. There are several purchase options. 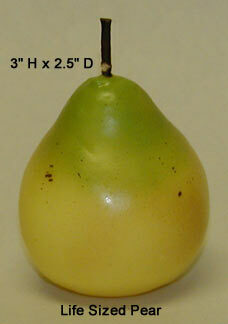 Small Pear 1.5" Large Pear 2.75"
Price is per single pear candy. Options are available. Must order in increments of 12 These are made to order, up to 3 weeks lead time. If ordering boxes, they are shipped seperately. 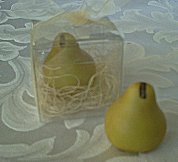 This chocolate pear box is a great favor for a perfect pear theme. Give these 18 oz chocolate pear boxes to the wedding party and all of your guests. These also make great corporate gifts. Each chocolate pear box has 4 - 3/4oz foiled pears with leaves and then the chocolate pear box is foiled in either gold or green. Each is then put into a cello bag and tied with ribbon. You can have a message or advertisement inserted before the pear box is closed. The message must be the same for all. You can put your message in the comment section below. Price is per chocolate pear box. Minimum order is 15. These designer personalized playing cards are great gifts for your guests. This is something that will be used over and over. There are several colors and so many designs to choose from. These designer personalized playing cards are great to give to families or individually. Write the personalization information (Names & Date) and also the design number in the comments field below. The design number is located in the bottom right corner of the card design. ~2-1/4" x 3-1/2" There is a one time $15 set-up charge. The personalized cards are packaged in tuck boxes w/ a die cut window front to show card design. Minimum order is 50 decks. No PMS color matching. Please keep in mind that there may be shade variations from lot to lot. 3-5 weeks for production after approval. Price is per deck of personalized playing cards favor. Price is not $0. Prices are based on quantity ordered. Prices are listed in the pricing drop down box. You must select the correct pricing based on the quantity you order. If you do not, your order will not be processed and you will not be contacted about it. These flip flops mint tins are the cutest thing! Your guests will love these flip flop mint tins. Each tin includes tasty sugarfree peppermints. 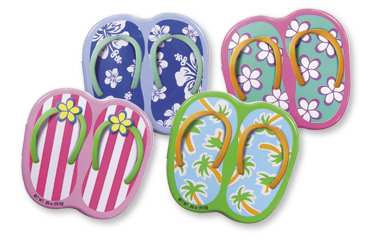 Each flip flop mint tin measures 2-2/5" x 2-1/2". These elegant mini salt & pepper shakers make a perfect pair. They are hand blown glass mini shakers make unique gifts. No two are exactly alike, except for being beautiful. The exquisite mini salt & pepper shakers are created using a technique called lampworking. The artist works the glass over a small flame of intense heat, adding luxuriant colors, blowing and shaping the piece to the desired form. These gems are ~1.75" tall and are packaged in a cute display box with a mini silver tray. These pieces of art are perfect for gifts or favors for showers, weddings, and parties. Price is per mini handblown salt & pepper set, including silver tray. Monogrammed Cookie Favors - The Perfect Pear Monogrammed cookie favors are the way to go. These cute pears are perfect wedding favors! You could use them in your hotel guests gift package. Or use them with a note attached to ask your friends if they will be a part of your wedding. These are also perfect for sweet sixteen parties. Personalized each one with an initial. Make sure you look at the personalized perfect pair hang tags. These would really make these cookies perfect. Each cookie is shrink wrapped and then put into a cello bag and tied with ribbon. 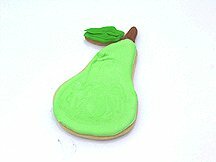 Each cookie is ~4.5" The pear is green with a brown stem and green leaf. Pear Bath Beads These shaped pear bath oil beads are great! The pear shaped bath oil beads are beautiful and smell great. A new twist on an old favorite. These pear bath beads are perfect for bridesmaids, shower favors, party favors, tea parties and more! The perfect pear for the perfect pair! These would look great in organza bags tied with personalized ribbon reading "The Perfect Pair" with your names and date. Price is per bag of 10 pear bath beads. 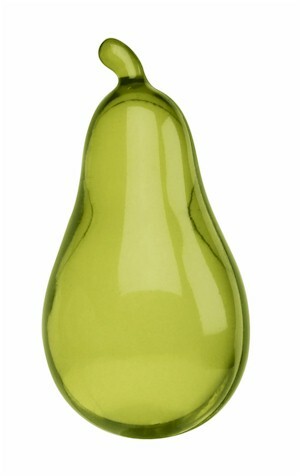 This beautiful pear glass candle is perfect for your perfect pear themed wedding or shower. They make great wedding favors or wedding table decorations, or both! Tell the guests to take the pear glass candles home with them as a special thank you. Have small bottles of oil at the exit as little extras. You can purchase lamp oil in so many different colors and it is very inexpensive, so if your decor is yellow pear or green pear, just purchase that color oil! Each pear glass candle is blown glass and ~4.5"H x 2.5"W Burn time is ~6 hours. Once the oil is gone, just refill and enjoy another 6 hours. Each candle comes with a fiberglass wick and funnel and comes individually wrapped. Price is per pear glass oil candle. 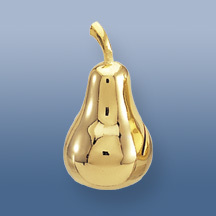 Pear Placecard Holder These really popular gold plated pear placecard holders will be a big hit at your next event. Each measures ~1 3/8" tall. Cards are included. Price is per set of 6 pear place card holders. Minimum order is 3 sets. Ingredients: Enriched unbleached flour(wheat flour, malted barley flour, niacin, reduced iron, thiamine, monoitrate, riboflavin, folic acid), sugar, partially hydrogenated soybean & cottonseed oils, eggs, invert sugar, vanilla, baking powder(sodium acid pyrophosphate, sodium bicarbonate, corn starch, monocalcium phosphate), natural & artificial flavors, salt, food color FD&C (Yellow 5 & 6, Red 3 & 40, Blue 1 & 2, titanium dioxide), calcium sulfate, fumaric acid. The perfect pair jar is a unique alternative to the traditional guest book. The Perfect Pair tent card asks guests to write down their wishes on individual Perfect Pair cards and place them in the jar. After you've stored those wishes away, the Perfect Pair makes a great cookie jar! ( Wish cards and Perfect Pair Jar sold separately ) Coordinating Perfect Pair Favor Containers and satin ribbon imprinted with Perfect Pair are also available. Plan to combine all of these decorative components to complete your Perfect Pair theme. Price is for the perfect pair jar only. Antique White Ceramic 8" x 12"H If you want to add a wish card kit (tent card with instructions and 50 wish cards), it is $8.50. You can also purchase more wish cards without the tent card separately. 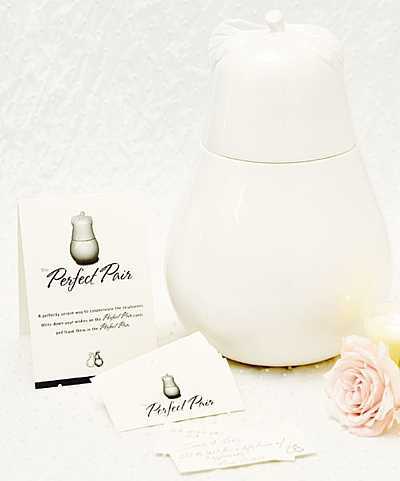 The perfect pair wish cards can be used with our perfect pair wish jar or any other great idea that you have. These cards make a great confetti card. Simply hole punch and tie with ribbon. pkg of 50. (4" x 2" H) Price is package of 50 pear wish cards. 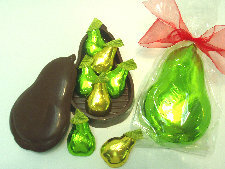 Perfect Pear Candy Bar Envelopes...Chocolate...the perfect favor. You will be a big hit with your guests when you send them home with a chocolate bar tucked inside this tasteful envelope. Envelope measures 6 1/2" x 3" and will be printed with your first names and wedding date in colored ink and the lettering style you choose. Ribbon sold separately. 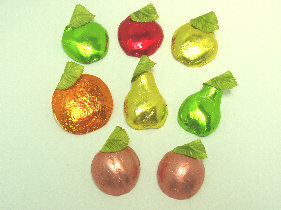 Price is per set of 50 perfect pear candy bar envelopes. Candy is not included. 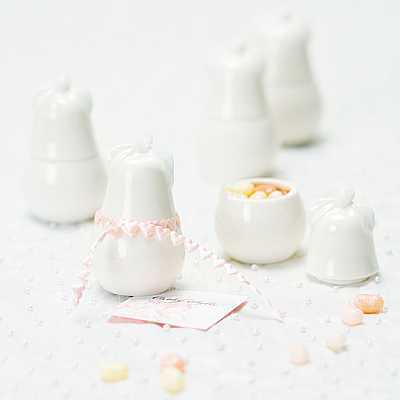 Harvest a roomful of delight at your event with a deliciously sweet favor as useful as it is adorable! “The Perfect Pair” cookie cutters will remind your guests that you were made for each other each time they pop a tasty, pear-shaped, home-baked cookie in their mouth. Nestled closely together in a 3.75” x 3” decorative wood gift box with a straw bed and a clear top, the two stainless-steel cookie cutters surround decorative pear background and measure 2.75” x 1.75. Brightening the gift box is a pear-green, satin ribbon with a “For You” tag in leaf design and a sticker that declares you’re “The Perfect Pair”. Price is per perfect pear cookie cutter set. Minimum order is 6. Perfect Pear Seals measures 2" in diameter and may be printed with your first names and wedding date in colored ink and the typestyle you choose. Price is per set of 24 perfect pear seals. Favor tins and candy not included. These beautiful cookies are perfect for "The Perfect Pair"! These 5" pear cookies are personalized with your names and date and the phrase "The Perfect Pair" These are vanilla sugar cookies beautifully decorated. Price is per cookie personalized. Each cookie is shrink wrapped. If you want the cello bagged and tied with ribbon, it is $1 per cookies. Pictured with cello bag and ribbon. Please enter your names and date in the comment field below. 2 week lead time. 24 cookie minimum. Price is per personalized pear cookie. 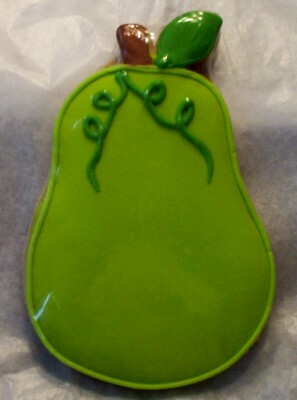 Personalized Perfect Pear Favor Tag For the perfect pair -- these tags will send a sweet message. Tie around real pears for winter wedding favors or pear-shape candles at any time of year. 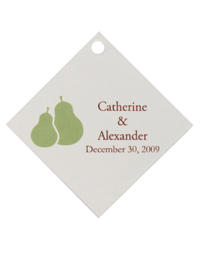 Sturdy cardstock features a pear design printed as shown.-- along with your names and wedding date.Choose a round, diamond, or rectangle shape and personalize with your names and wedding date. Sold in packs of 30. Price is per set of 30. Put personalization information in the comment field below. Created by USA Sat, Inc. © Wedding Favors | Bridal Shower Favors | Favor Idea. All rights reserved.